Powered by natural pressure and electromagnetic force, high pressure solenoid valves are also easily operated by remote devices that activate the solenoid coil, making high pressure solenoid valves extremely useful for operating potentially dangerous machinery or inaccessible lines. Numerous applications for high pressure solenoid valves include controlling fluid flow in and out of automatic transmissions, regulating pressure in piping systems, boosting water supply pressures in supply mains in order to supply water for fire fighting, allowing high rise buildings to overcome pressure loss as the elevation increases, and maintaining water supplies in supply tanks and water towers. Water pressure reducing solenoid valves, in particular, contribute to environmentally friendly companies by reducing water pressures since high water pressures waste water. Installed in systems immediately following the water meter for commercial buildings, residential homes, manufacturing plants, warehouses and more, typical industries that benefit from the use of high pressure solenoid valves include petroleum, chemical processing, food and beverage, pharmaceutical, and metallurgical. High pressure solenoid valves function to reduce fluid or gas pressure through a variable flow area inside the valve that allows for a permanent pressure drop across the valve. 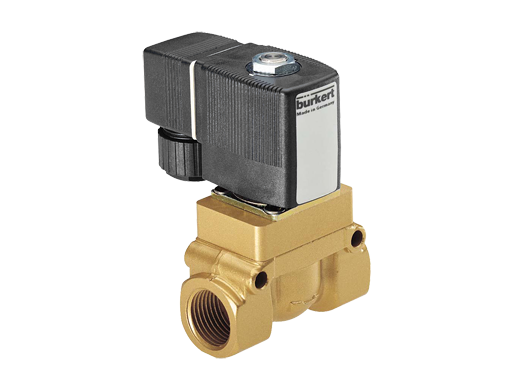 The high pressure solenoid valve typically consists of a spring-loaded, heat-resistant diaphragm that is connected to a device that regulates the valve’s flow opening. The incoming fluid pressure reacts against the diaphragm’s force in order to achieve force equilibrium. The high pressure solenoid valves may be either a normally closed (NC) valve or a normally open (NO) valve. In an NC valve, a plunging pin or rod within the valve is held blocking the passage of air or fluid by a solenoid coil; the air or fluid pressure coming into the valve helps keep the valve shut as long as the pin blocks the passage. In order for gas or fluid to flow through the valve, an electromagnetic charge activates the solenoid coil, which lifts the plunger out of the passage and allows flow through the entire valve. NO valves are the opposite; they remain open until the solenoid is activated and pushes down the plunger, blocking flow and creating pressure to keep the valve closed. In addition, pressure control solenoid manufacturers make two main types: direct-acting and pilot-operated. The more popular of the two, direct-acting pressure control solenoids have a plunger that is in direct contact with the in-flow opening in the valve body, or orifice. This plunger is used to open and close the orifice, which permits or hinders flow. 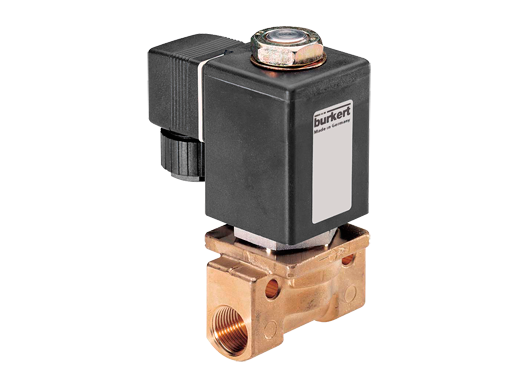 The pilot-operated high pressure solenoid valve works with a diaphragm rather than a plunger, using differential pressure to control the flow of gasses or fluids. High Pressure Solenoid Valves High pressure solenoid valves are solenoid valves that control the flow of fluids or gasses in high pressure applications. Typically used to reduce fluid pressure, pressure reducing solenoid valves provide steady pressure into systems that operate at lower pressures than the fluid supply system.